These proceedings of a conference held in June 2006 in Cambridge, Massachusetts, provide an overview of issues facing astronomy librarians around the world. The conference theme of 'Common challenges, uncommon solutions' reflected the range of problems encountered by astronomy librarians and the creative solutions they have developed for them. The conference also provided an opportunity for these librarians who usually work in physical isolation from colleagues, to meet each other and communicate in person rather than electronically. The value of such meetings cannot be overestimated. A wide range of topics was covered, ranging over matters such as the Virtual Observatory, citation analysis, open access, the Astrophysics Data System (ADS), preservation of material, the history of astronomy, elecronic journals and numerous other matters. The papers in this volume are talks given by 9 invited speakers, and papers derived from 28 oral presentations and 34 posters. Researchers in astronomy would benefit from perusal of this volume, since too much of what their librarians do for them tends to be invisible and taken for granted. 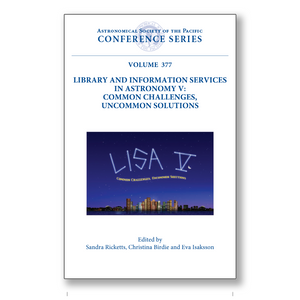 John Huchra, in his paper at this conference, said, among other things: "Libraries have always been the one place to consolidate information about accessing information. You should continue this task and advertise your skills." That is what this volume hopes to do.